VA Secretary David Shulkin made two surprise announcements Wednesday before the Senate Veterans Affairs Committee that should relieve some financial stress for more than 600,000 veterans. First, Shulkin said he was dropping VA’s appeal of the Staab case decided last year by the U.S. Court of Appeals for Veterans Claims. Only last week he said Staab had been wrongly decided, exposing VA to at least $2 billion in veteran claims for outside emergency care, money VA needs to provide promised services. Pulling the appeal means VA intends to begin covering private sector emergency care for all VA-enrolled veterans, even if they have alternative health insurance that pays part of their emergency care costs. As many as 370,000 veterans with pending claims could benefit too, explained Sen. Mike Rounds, R-S.D., who thanked Shulkin for changing his mind. Shulkin said Rounds and Sen. Richard Blumenthal, D-Conn., were right to sharply criticize the decision to appeal. In Staab, the appeals court ruled that VA intentionally failed to implement a 2010 law expanding outside emergency care coverage. It did so by continuing to deny reimbursement for non-VA emergency care if a veteran had any sort of alternative health insurance. Veterans with no health insurance routinely are reimbursed the full cost of outside emergency care if VA care isn’t available. Shulkin told Rounds that VA has completed draft regulations to implement the new emergency care benefit, sending them to the Office of Management and Budget (OMB). Draft regulations must clear OMB and be published in the Federal Register for comment before VA can begin reimbursements. That process could take nine months or more, Shulkin told the committee last week. Shulkin’s second surprise Wednesday was to tell Sen. Dean Heller, R-Nev., that he will work with Congress to find a less hurtful way to fund his Choice replacement plan, CARE, than by administratively ending Individual Unemployability (IU) eligibility next year for 208,000 seriously disabled veterans age 62 or older. IU allows veterans with VA disability ratings of 60 to 90 percent to receive enhanced compensation because they are unable to work. 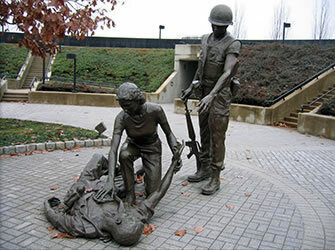 IU qualifies veterans to receive disability pay as if they were 100-percent disabled. It adds an average of $1600 to their monthly payments, a VA official told senators. A week earlier Shulkin said he did take “very seriously” concerns being raised over the proposed IU cut. “Nobody wants to be taking away … benefits from veterans and certainly not putting them into poverty,” he said. But he noted that VA benefits had climbed by $12 billion in the past two years, which justified a review of benefits to verify the purpose of each. A panel of representatives from veteran service organizations testified after Shulkin again this week. One of them cautioned that the new secretary is taking politically expedient steps that, if Congress declines to fund them, could punch deep holes in VA budgets and lead to cuts in more traditional benefits and services. Carl Blake, associate executive director of government relations for Paralyzed Veterans of America, scrutinized what Shulkin promised that afternoon regarding the IU program and pulling the Staab appeal. He also noted Shulkin’s recent announcement to replace VA’s legacy health records system using the same off-the-shelf software from Cerner Corp. that the Department of Defense is using to create MHS Genesis, its own modern electronic health record system. Each of those actions, Blake said, potentially widens a funding gap for VA that Shulkin hasn’t explained how he will fill while promising to reform the unpopular Choice program and still meet budget targets set for the Congress. Opting to contract with Cerner to modernize VA records using the same software being adopted by the military “is probably the right decision to make for VA,” Blake said. But VA’s cost is estimated to be three to four times the $9 billion that the Department of Defense has budgeted for its project, Blake said. “How does the VA’s budget rationalize that point?” he asked. “I’m sure it doesn’t” because Shulkin selected Cerner using a non-compete waiver with no negotiations held yet on what the new record system might cost the VA. So, Blake said, “we have a $3.2 billion IU hole for Choice. We have approximately a $1 billion hole for Staab. And then we have the Cerner issue and don’t even know what that hole looks like. Right now, VA could be staring at a huge hole in its budget for 2018” even as appropriations committees begin to markup VA funding bills taking no account of the changes Shulkin just announced. The worry for vet groups is that VA will come to look so costly that taxpayers will demand its prized health system be dismantled in favor of private-sector care.